Laurel and Chuck are the proud parents of three grown children and devoted grandmother to eight beautiful grandchildren. When their two-year-old grandson was diagnosed with JM, Laurel and Chuck became very involved in caring for him and his younger brother. They both believe strongly in the importance of grandparents supporting their families, supporting each other and supporting Cure JM. 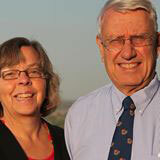 Recently retired, Laurel and Chuck have stepped forward as Cure JM Grandparent Network representatives. Their goal is to support, encourage, and assist other grandparents who want to support each other and/or make a difference for their grandchildren. To learn more about the Grandparent Support Network or how grandparents can get involved in Cure JM, contact .